Magic players love nostalgia. It’s not necessarily a “things were better when…” attitude. Sometimes it’s just that “things were different and I enjoyed that too,” as well as the fun that comes along with resolving favorite old cards, or even just seeing and thinking about them. Frequently that nostalgia will surround the era you started playing, when you were first learning the game and absorbing as much as you could. Good or bad, those cards tend to stick with you. Most players started in the Modern era, so they can get play their early favorite deck or card or strategy in the Modern format, even if it’s not the best path to victory, just to get that hit of remembrance. Old School likewise fills a need for people who want to get that historic Magic feel—simpler creatures and spells with “classic” art. Middle School fills in between Old School and Modern, allowing sets from 1995 (Ice Age and Fourth Edition) to 2003 (Scourge), stopping at the frame change with Eighth Edition. Deck construction rules tend towards inclusion, allowing pretty much anything printed during that time: promos (except Mana Crypt, part of a small Banned List), ancillary sets like Beatdown, any gold-bordered Championship Decks, and all three Portal sets. That’s a lot of cards! These allow a lot of great decks, many of which haven’t been fully explored simply because not all the cards were legal in the same format at the same time, except in Legacy and Vintage, where they’ve already been outclassed. From what I’ve seen, there are all kinds of archetypes available to players. Aggro decks have tribal and synergistic examples, and are very few turns behind the combo decks, meaning even that potentially lopsided matchup is challenging when one side stumbles. Midrange has excellent historical examples to learn from, and control has good options, being challenged mostly because the format is broad enough to allow so many disparate threats. There are also some interesting challenges to all Middle School deck building, including—as Jake mentions in the podcast—that mana fixing is far from perfect. Should you stick closer to two colors, or are you OK adding more and accepting the risk of not having the mana you need when you need it? We talk a lot about the format and what’s possible. 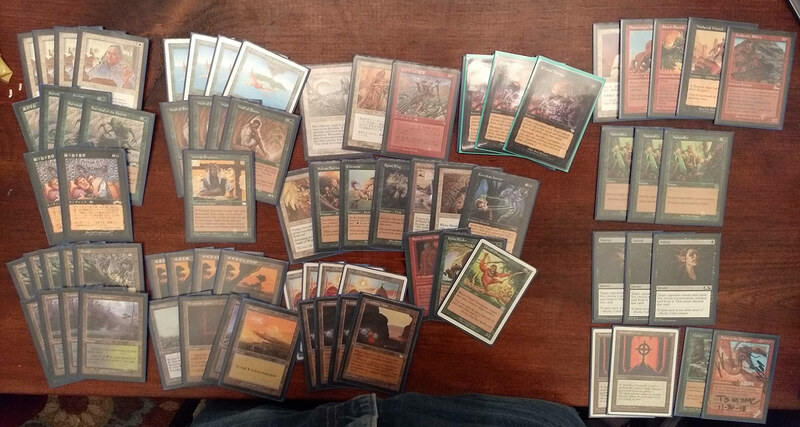 I’m going to post some decklist photos, but you should know they’re for inspiration only. None of us would suggest that these are the best decks in the format or even necessarily optimal examples of their own kind. Just look at these hot pix and get excited about playing with old cards. 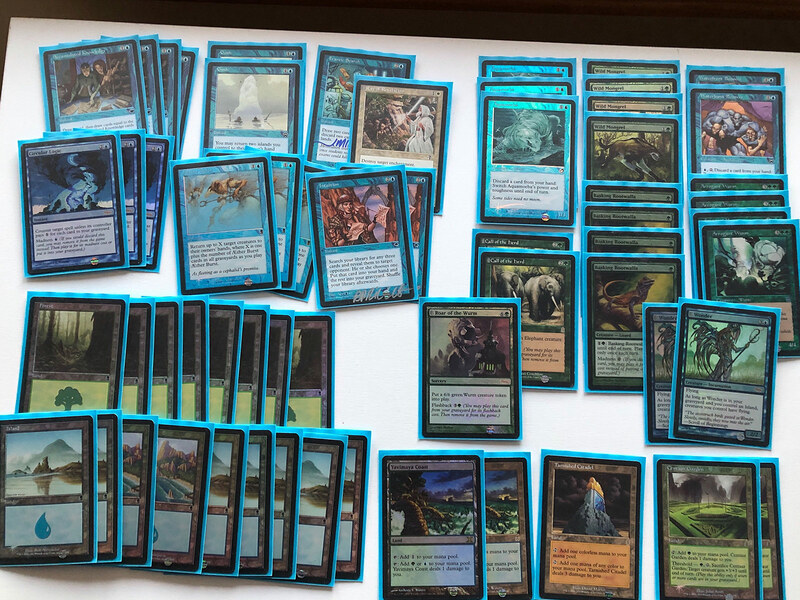 First up is Josh Chapple’s UG Madness deck, which is great because I’m pretty sure he was able to just pull this off the shelf as-is when he heard the format was created. Counters, card draw, and efficient creatures. Pretty straightforward. 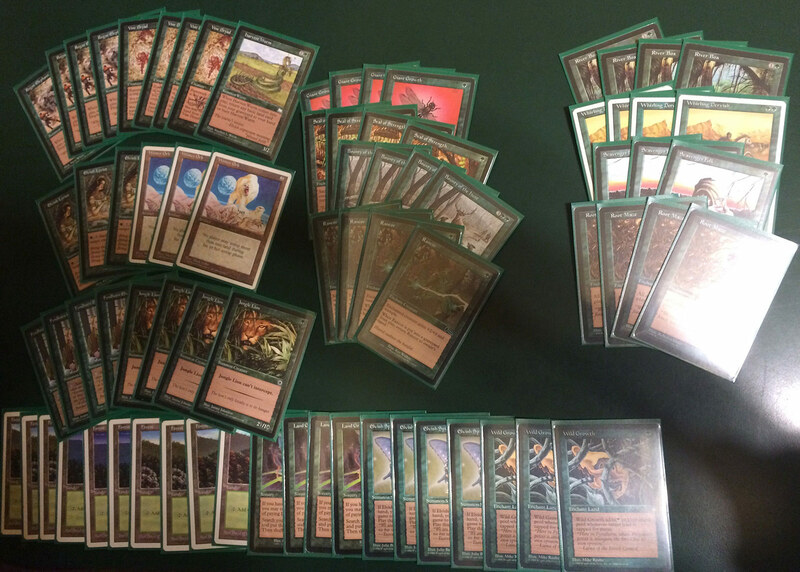 This is mono-green 10-Land Stompy. 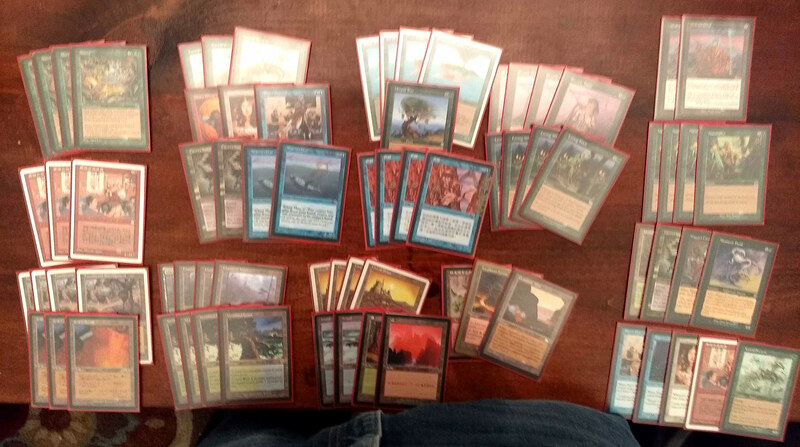 When I told my local store owner about the format he was very excited to be able to build this deck. There are a few adjustments I would make, but it goldfishes very well. Jungle Lion can’t intercept, but it can attack pretty well. This Aluren deck from Jake does a couple of things that a lot of Middle School decks do: Birds of Paradise as a mana fixer, and Intuition as a Demonic Tutor. Also notice Living Wish and Rhystic Tutor. This deck will find what it wants. 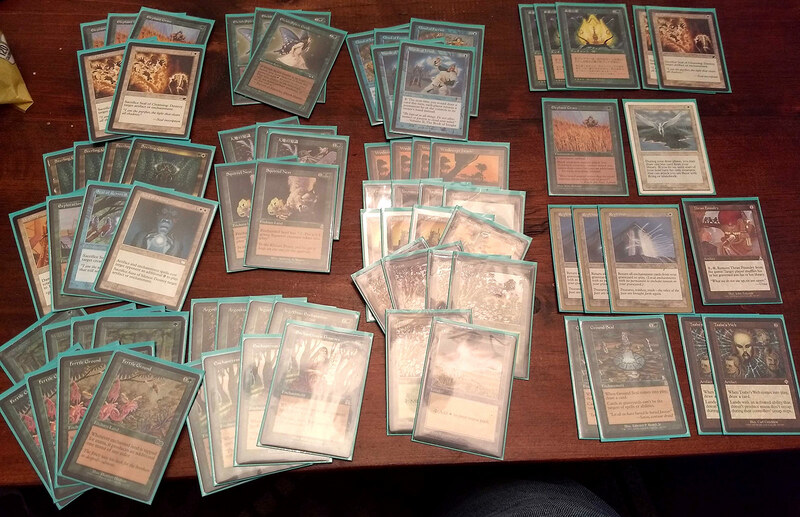 Eggs (Helm of Awakening Storm) was the first deck I played seriously in Vintage, and I was really excited when I realized I could play it competitively in Middle School. Being able to Frantic Search for two mana and untap three lands is a real treat. 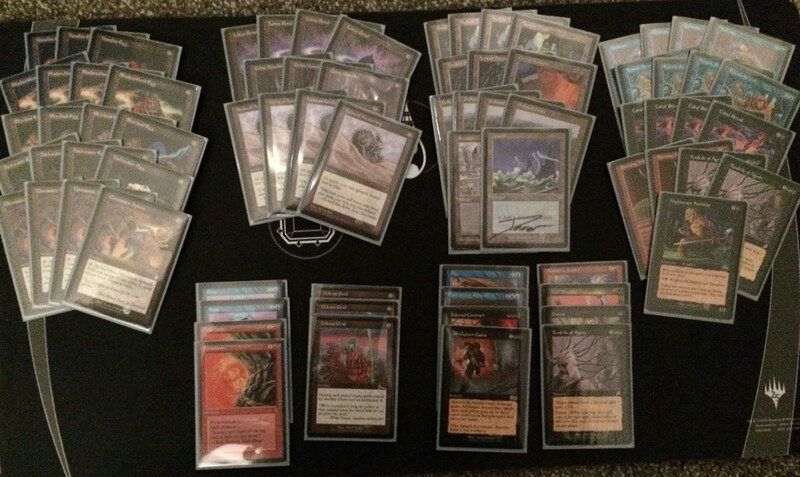 The sideboard at the bottom is mostly for Burning Wish. Jake will play Enchantress in literally any format, so obviously he has a Middle School version. This plays lots of answers to various threats, can lock out an opponent with Words of Wind, and might even win with Squirrel Nest. Wheaties (one of many “cereal decks” in the format) uses Academy Rector to put together enchantment combos, primarily Enduring Renewal and Goblin Bombardment, or Survival of the Fittest and Recurring Nightmare. 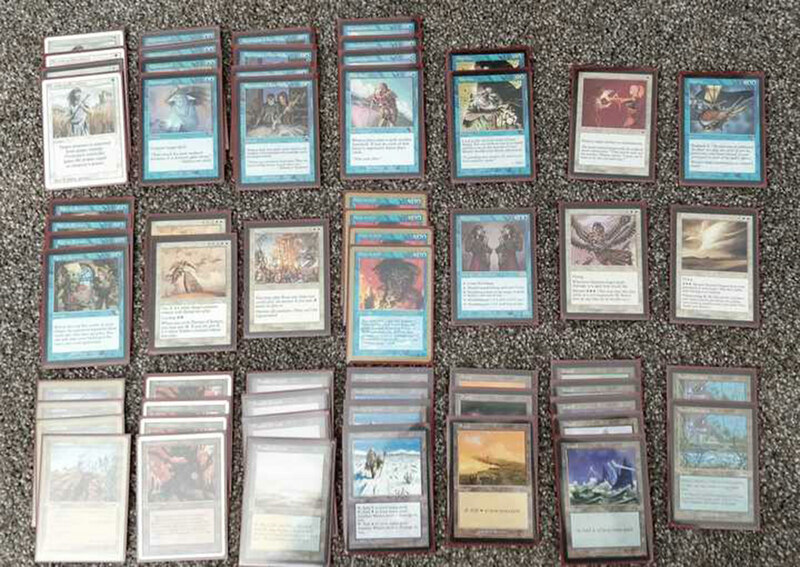 Steve’s Landstill deck is an example of one of the control decks in the format, with lots of card draw and removal. You can sit behind Standstill and attack with Mishra’s Factory or Faerie Conclave, and even cycle Decree of Justice to make tokens. How fun! That’s just a few examples of what neat things are available in the format. Keep in mind too that any of the gold-bordered Championship Decks are legal as well, and most of them are going to be playable (and competitive!) right out of the box. UPDATE! If you’re interested in playing Middle School and are coming to Cleveland for Magic Fest, we got you covered! Friday evening, February 22, at 7 p.m., Team Serious is hosting a Middle School event at Mars Bar, a great local bar with beer and gyros in Lakewood, a short ride from the convention center. Even if you don’t have a deck or are getting in after 7, this will be a great opportunity to meet people and learn about the format! There’s also an Old School event hosted by the Cleveland Rocs for the benefit of Providence House, one of the oldest and longest operating crisis nurseries in the country. Entries are limited to 32, and they’re almost full, but there is a waiting list for cancellations or other provisions. That event will be at Bottle House in Lakewood (see below), on Saturday, February 23, at noon. Magic Fest Cleveland is coming up February 22-24, with its usual schedule of Magic tournaments, side events, artists, and ephemera. If you’re coming to the North Coast later this month, Team Serious is happy to present a list of food and drink recommendations before, during, and after your gaming adventures. Highly recommended and nearby the convention center, Pho Thang will offer hot Vietnamese soup and sandwiches that should be perfect for Ohio in the middle of winter. Also within walking distance is Mabel’s BBQ, which features “Cleveland-style” barbecue, as created by Michael Symon of Food Network fame. The area near Mabel’s, around Prospect and E 4th streets, has several other restaurants probably good for a post-tournament meal as well. A short Lyft away is the Ohio City area (outlined in red on the map), which surrounds the West Side Market. The market has fewer prepared foods than Reading Terminal Market in Philly or North Market in Columbus, but it’s a similarly fun place and great to pick up snack items if you’re there during the day. Try some of the different jerkies. Ohio City also has several bars and restaurants. Listing just a few: Bar Cento (open late, voted “Best Pizza in Ohio”), Great Lakes Brewing Company brewpub, Flying Fig for creative fare, and (if it’s not too cold) Mitchell’s Ice Cream. 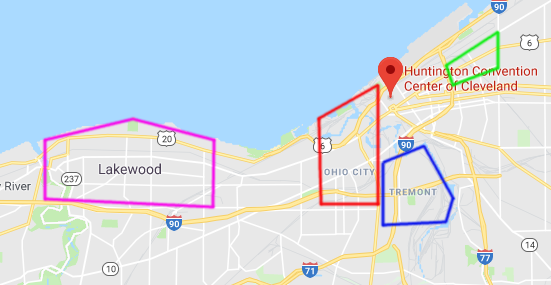 Tremont is next to Ohio City (in blue) and also has several restaurants and bars, as well as the house from the movie A Christmas Story. Steve recommended Prosperity Social Club for comfort food and beer, and Restaurant Ginko for sushi. Ginko is closed on Sunday but open till midnight on Friday and Saturday. In Asia Town, east of the convention center also a brief ride away from the convention center (in green), try Szechuan Gourmet or Han Chinese Kabob and Grill. If you’re there early enough (before 8 p.m.) or want a quick lunch, you can also stop at Koko’s Bakery, which has sandwiches, bubble tea, pastries, and Chinese buns. A little farther away to the west is the suburb of Lakewood, where the Old School and Middle School events will be. Lakewood has the original location forMelt, which serves outstanding and creative grilled-cheese sandwiches. They’ve since expanded to Columbus and beyond. Proper Pig is there as well, which was mentioned alongside Mabel’s as good barbecue. And for drinks, LBM describes itself as a “friendly neighborhood viking cocktail bar” and has great burgers, while Bottle House is the brewery and meadery where the Old School event will be held on Saturday. For food, try also Sarita, a restaurant, which has happy hour 5-9 on Thursday and Sunday if you’re in the city early or late, or Georgetown for cocktails and live music. Steve also recommends Good Company for burgers and boozy milkshakes; it just opened. He also touted the grouping of Plum Cafe, Platform Beer Co., and B and G Tavern (for cheap beer and pool), all in the same area of Lorain Avenue. And Jake likes Mason Creamery, an ice cream shop that transforms into a ramen shop during the winter, as well as Jerry Yang’s favorite pizza in Cleveland, Angelo’s. They’re also in Lakewood but they deliver. Cleveland has a burgeoning food scene thanks to local chefs like Michael Symon and Dante Boccuzzi, so there are definitely places to check out. And as mentioned, it’s the Midwest, so drinking is pretty cheap. Let us know if you have questions or want more specific recommendations. When did you start playing Magic? What cards from Middle School get you excited? Have you ever played Oath of Druids without Forbidden Orchard? Should Mind Twist be banned if Dark Ritual already is? Are you coming to Magic Fest Cleveland? Great! You should say hi! 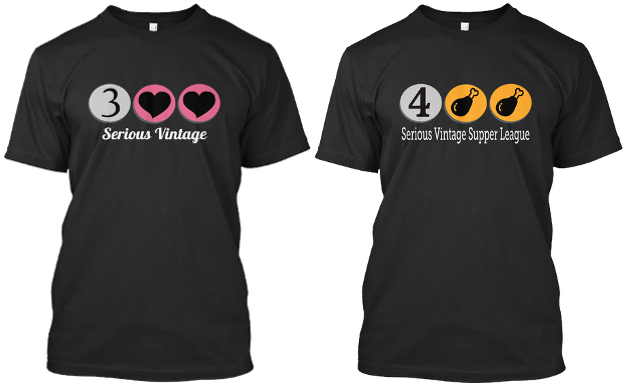 We’re glad you’re interested in Vintage, Middle School, and all of the things we talk about on Serious Vintage. If you’d like to support us financially, maybe you and your friends and loved ones would enjoy a T-shirt. For the next three weeks (until February 15, in time for Valentines!) we’ll be selling shirts to raise money to improve podcasting and Team Serious streaming technology.